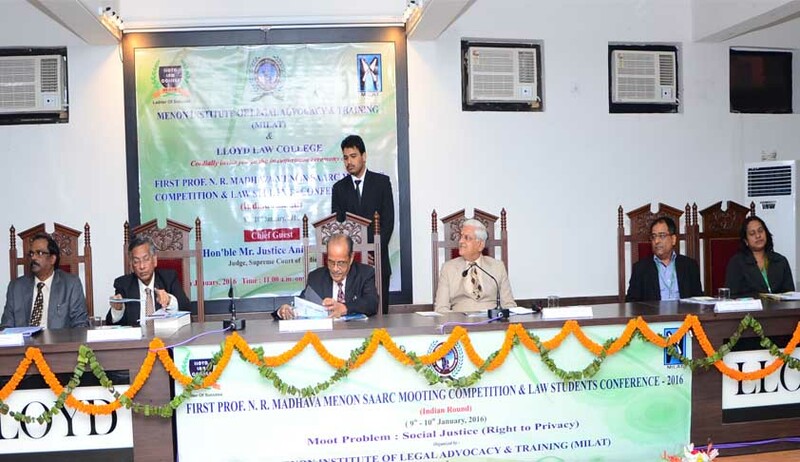 “You do the best, never mind about the success” was the advice by Hon’ble Justice Anil R Dave to the practising lawyers while inaugurating the first N R Madhava Menon SAARC Mooting Competition (Indian round) that took place today at Lloyd Law College in Greater Noida under the technical support from MILAT – Menon Institute of Legal Advocacy. Citing an incident, Justice Dave recounted the event where he being a judge got mesmerized by the pleadings of a young lawyer who later on discovered to be a national law school pass out. He congratulated Professor Madhava Menon on initiating the five year law course and encouraged all the students to outshine in the legal profession. Padmashree Prof. (Dr.) N R Madhava Menon was the Guest of Honour and in the address he focused on the dire need for uplifting the quality of legal education with the co-operation between bar, bench and academicians. He narrated the appalling state of law education in 1950’s by quoting M C Setalvad’s 14th Law Commission Report where it was stated “plethora of law students were like half-baked lawyers, who were let loose upon society as drones and parasites”. Prof Menon stated that however presently, law students are encouraged into an intellectually stimulating task by involving into skills of analysis, synthesis, articulation and writing. In his special address the Senior Advocate Mr. R. Venkataramani mentioned the necessity for liberation of people from power vested in few hands through social justice, which is the very theme of first N R Madhava Menon SAARC Mooting Competition. He mentioned Peter Frankopan’s book Silk Roads: New History of the World and highlighted the requirement to have a South East Asian prominence in developing innovative jurisprudence which could be achievable only when interactions with SAARC law countries are possible. Total number of 30 teams comprising students from various leading law schools, across the country has registered for participating in this groundbreaking event. The theme of the moot court is “social justice” and is based on the much debated recent issue of ‘Unique Identification (UID) Number’. The competition aims to encourage talented young lawyers to consider pursuing the career in litigation. The Inaugural Function saw the presence of many eminent legal luminaries. The dais was shared by Professor (Dr.)S. Sivakumar , the Honoraray Secretary MILAT and the Mr Manohar Thairani, President, Lloyd Law College. The final five teams of the Indian round will be selected for the SAARC round that will be held from 4th – 5th March 2016, which will see the participation of students from Pakistan, Sri Lanka, Bangladesh, Maldives, Afghanistan and Bhutan along with India. A conference of Law Students from SAARC countries will also be held there after the competition on 6th March 2016.